In order to improve the performance and operational efficiency of businesses worldwide, a customer using SAP® wanted to establish a global business program to define and implement a standardized, group-wide business process architecture and associated master data for the parameterization of the group of software tools. * Test the application to be sure that it can sustain such growth. * Prove the manageability of the solution. * Provide recommendations to optimize the infrastructure architecture. This project illustrates the new near real time business intelligence (BI) context approached by customers who want the ability to rapidly analyze their business data to gain market shares. Data today comes from many diverse global sources and needs to be merged into an intelligent data warehouse. 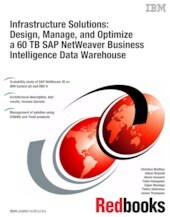 This IBM Redbooks® publication describes the testing that was done in terms of performance and manageability in an SAP NetWeaver® BI and DB2® environment on IBM System p™ when scaling a client's solution to a data warehouse of 60 terabytes (TB). This book resulted from a joint cooperative effort that included the PSSC, the IBM/SAP International Competency Center, the DB2-SAP Center of Excellence, SAP AG, and a customer. The customer involved in this project is a worldwide company employing more than 250,000 employees with factories and logistics operations in almost every country in the world. * Chapter 1, "Project overview: business objectives, architecture, infrastructure, and results" on page 1, summarizes the entire project, starting from the business needs through the description of the environment and options used, to the results achieved. This chapter can be viewed as an executive summary from an IT specialist perspective. * Chapter 2, "The SAP NetWeaver BI perspective" on page 47; Chapter 3, "The DB2 perspective" on page 127; and Chapter 4, "The IBM System p perspective" on page 287, provide detailed views of the project from the perspectives of SAP specialists, DB2 specialists, and System p and AIX® specialists, respectively. * Chapter 5, "The system storage perspective" on page 319, and Chapter 6, "The Tivoli Storage Manager perspective" on page 349, describe the storage environment and the manageability issues in such a large environment. * Finally Appendix A, "The scripts used" on page 395, provides the scripts that we needed to develop for this project.